"Second Chances - Transforming Adversity into Opportunity," by Chuck Gallagher, is an inspiring self-help book about how living with integrity can improve one's life. Gallagher was a tax principal at a CPA firm in the 1980s when he made some bad decisions that ultimately lead to him being convicted of a white collar crime. 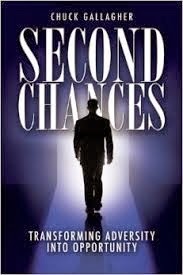 "Second Chances" chronicles the transformative process of this experience, showing the reader how Gallagher decided to live a life of integrity and was rewarded for it. Gallagher's writing is compelling and inspiring; he mixes flashbacks to the events surrounding his crime with advice and inspiration. The book is organized into chapters that each give the reader a lesson about how to transform one's life. The central theme of the book is that, with the right mindset, anyone can turn adversity into opportunity. Overall, this is a great self-help book for anyone who wants to make opportunities for leading a happier, more fulfilling life.